The first step is to set up your servers with individual public IPs. (That was easy). Now make an “A” record for each one in your DNS configuration. The result is that your DNS server, such as bind, will rotate the IP addresses handed out to remote clients. This is the default behavior for most DNS servers; if it isn’t the default for yours, customize config as necessary– this writeup is not going to go into detail about such configuration. If you need to, Goog it. Notice also that Google is using a 300 second TTL on its “A” records. This helps (but does not eliminate) client-side DNS caching that can lessen the effectiveness of the round-robin DNS load balancing. 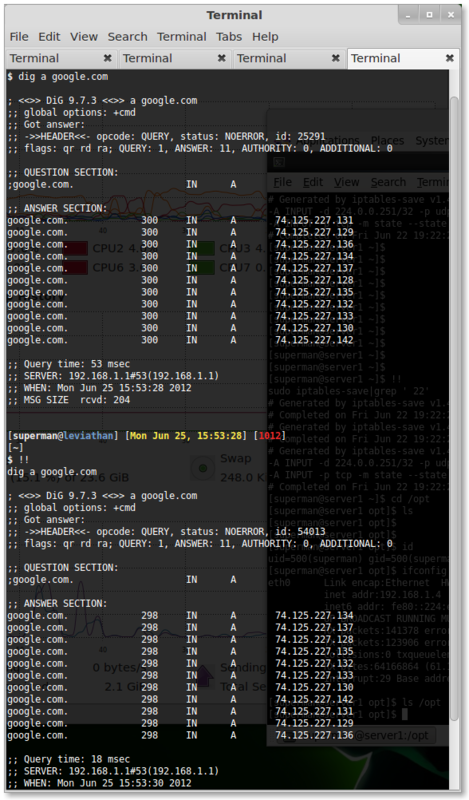 For a TTL that low, you’ll need some beefy name servers, and DNS service that lets you set a TTL that low. I think that for most purposes you don’t need to have a TTL that low, however. A TTL of 15 to 30 minutes is fine for most websites. Bear in mind that due to the nature of very common client-side DNS query caching, your round-robin DNS load balancing is not likely to distribute the load on your remote servers on a per-request basis. It will be more like a per-session basis. Nothing is truly guaranteed, however, without real hardware-based load balancing. In-Line Search And Replace With Perl Regular Expressions.